I take shrimp [peeled and deveined for your convenience] and season it with salt, pepper, garlic powder, paprika, and cayenne pepper. Simple and quick. 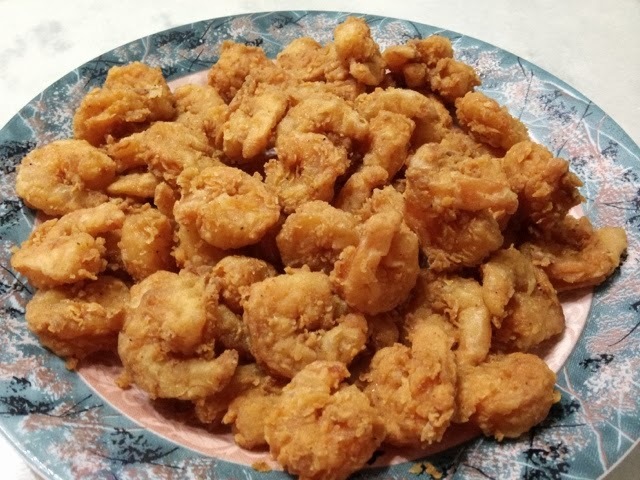 While I don’t add salt to the shrimp if it’s being served with a sauce [like my version of the Bang Bang Shrimp], I do find that you will need to add a little bit of salt if you are simply just frying the shrimp for something like popcorn shrimp. Add in egg and a little milk [amount of both depending on how much shrimp you are working with… just enough to “wet” the shrimp so the breading sticks]. When you are ready to fry them, in a ziploc bag [for convenience and easy cleanup], add in flour [amount depending on how much shrimp you are working with] and season the flour with black pepper, garlic, paprika, and cayenne pepper. Shake well to make sure the flour is thoroughly seasoned. Add in the shrimp, in batches, to the flour. Shake well. Fry them until they are golden brown! Next time, I’ll try baking these and seeing how they turn out. I&#39;m going to try this – thank you! Your welcome Carole, I hope you like it!